"Who are we if we can't protect them?" Actor/director John Krasinski (in full beard mode) takes a dramatic turn for his latest directorial effort. He co-stars with real-life wife Emily Blunt in an effectively terrifying survivalist family thriller appropriately titled A Quiet Place. Based on a B-movie horror premise where noise sensitive, violent monsters of unknown origin are acutely attracted to only sound, the literally quiet film uses the absence of sound to mine some serious tension cinematically. 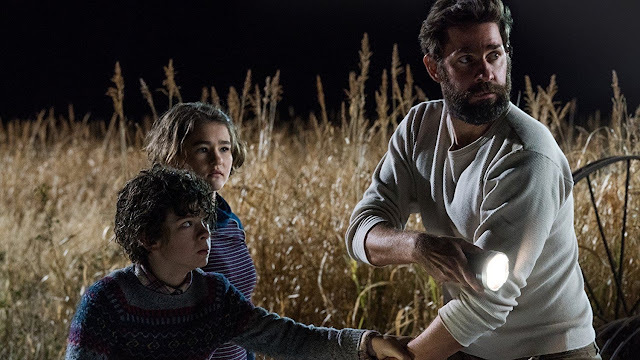 Co-starring child actors Noah Jupe and Millicent Simmonds as Krasinski and Blunt's young children, they bring a real sense of immersive unity to the family horror. Simmonds, who is deaf in the film and in real-life, adds an inherently naturalistic gravitas to her emotional performance. It's subtextually suggested this particular family has only survived where others have perished due to their knowledge of sign language as a means of communication heightening the ingeniously simple concept subtlely. Adding to the sense of desperation and dread, Blunt's character is pregnant giving the bare story a ticking time bomb element. Krasinski fully realizes how to weaponize the lack of sound. Everything is essentially an extended metaphor for the anxieties of parenthood and the struggle to keep one's family safe. The nameless mom and dad try to provide semblances of human experiences while protecting their frightened kids from a hostile world. From a script by Bryan Woods and Scott Beck, then re-written by Krasinski, A Quiet Place is somehow both briskly paced at a scant ninety-five minutes yet patient in its storytelling. Despite the fine monster premise, the clear weaknesses and ideas around avoiding danger are unavoidable. How this family, established quickly as competent survivalists, was able to survive so long without finding obvious ways to defeat the mysterious creatures becomes more and more obviously foolish as the plot unfolds. Produced by action director Michael Bay, the film is packed with mannered exchanges of tension and bursts of terror. Needless to say, the sound design superbly expresses the silence filled moodiness. It's too bad Krasinski reveals too much about their situation through clunky, wordless exposition and multiple encounters that feel very preventable. The logic, consistency, and world become less dramatic and more unclear after the fear is quickly instilled. A Quiet Place is a riveting piece of genre filmmaking full of top-notch cinematic dread outside of being nearly silent. Krasinski and Blunt make a dynamic pairing on screen and the former shows his talent as a serious filmmaker. However, the more you think about the contrived plot to maintain its crippling sense of fear despite clear and obvious possible solutions, the tight thriller starts to fall apart the more you think about its premise.